Actually, I know. I was up really late (for me) last night, so I didn’t settle down until nearly 0000 hours. After spending the evening with dear friends (might as well be family), I needed a little time to decompress. That especially after the drive home. Texas Loop 289 was ice-covered in places and the ice was very dark. Fools (yes, morally deficient) were driving too fast and following too closely, plus one lane was only partially open. I passed a wreck being worked by first-responders in the southbound lanes. I kept my distance from the vehicle in front of me because the fool behind me was pressing. So, I exited the highway and made my way carefully along the frontage road to my hotel, eased into the parking lot, and found a spot. The Girl and I exited the vehicle gingerly, given the ice and snow still present on the lot. Plus the refreeze was starting, so there was patchy black ice. I have no interest in falling. But, the evening was worth it. There are some relationships I neglected over the years. That was not by intent, but it seemed every time I made it here to Lubbock I was deluged with must-do’s for work of family. The things I wanted to do and the people I wanted to see were neglected, much to my chagrin. So, this time I am spending much time with those whom I always wanted to spend time with but was frustrated by circumstances outside my control. I have some control now and I’m using it. So I wasn’t up at the buttcrack of morning (too cloudy for dawn) but early enough. I’m working through Michael Hyatt’s Best Year Ever as part of my growth plan for 2016. So, I worked through one of the lectures for that training, finished my coffee, and rounded up the Girl. We drove over to Higinbotham Park because I’m crazy for some longer walks and to get her out and give her a good play. So, we walked about 1-1/2 miles and she got to run, sniff, poo, pee, and be crazy for a few minutes. After days cooped up in the room, it was time — for both of us. On our way home we stopped at the Lebensmittelgeschäft to reprovision. The Girl is needing some work on her public behavior so we worked on that a bit while shopping. I got what I need (eggs are back in stock finally) and what I want (a decent Cabernet Sauvignon) and we returned home. The Girl wanted food, so I fed her and gave her a bit of a treat by opening some wet food and mixing it with her kibble. She did an excellent down-stay while I placed her bowl, retrieved her water bowl, and refilled her water. I gave her permission to come to me, then released her to eat. I need more exercise (it’s one of my long-term goals), so I did three circuits of calisthenics to push this old body a bit. My DOMS abated late yesterday afternoon, so I expected to be mostly recovered from my last training. I had a little soreness during my workout, but not bad and still managed to push out my targets and eke a bit more out of a couple of exercises. Then, finally, I fed myself, watched a couple of YouTube videos (on bushcraft), and cleaned up. 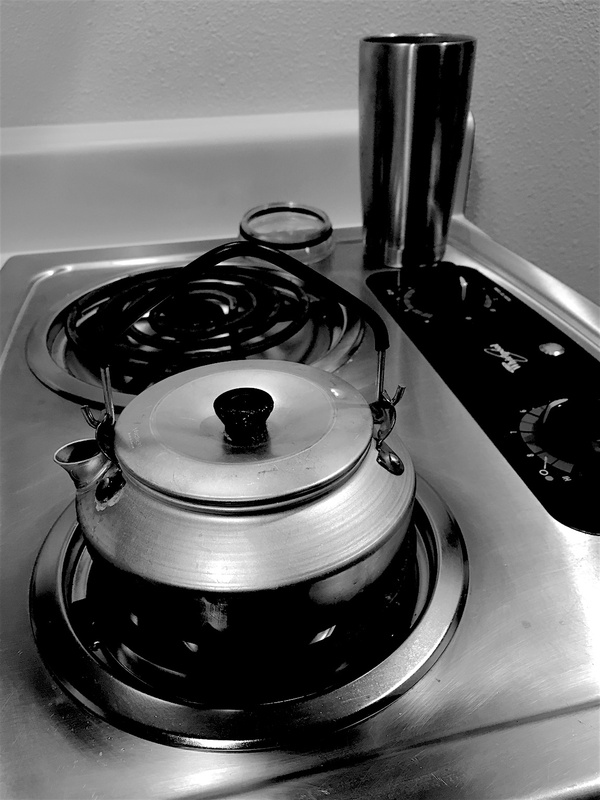 The little teapot in the image is from my Trangia stove kit. It’s the perfect size for one person and I use it daily. I love my Trangia kit. It’s really all I need for most of the cooking I do. I just finished a nice chat with Older Son, who is buying himself and his bride a nice treat and wanted my input. Now I’ll go shower and get on with my day. This is my life. There are many things about this life that I like. I have the freedom to determine my schedule. I have the responsibility to work on those tasks and projects that are important to me. I love that combination of freedom and responsibility. I have not needed someone to tell me what to do in a very long time. I do not need someone to tell me what to do now. If I can figure out how to generate enough work to pay my bills, I can do this a long time. There is a part of me that wants that. The question will be whether I want it bad enough to work out the details of keeping work in my queue. That’s part of my inner work. In the meantime, it’s New Year’s Eve! The year 2015 is ending and 2016 approaches. For once, I’m excited to see what the next calendar year will bring. My attitude is that I expect good things to happen. Let’s go! Happy New Year’s Eve, Dave. Happy New Year, Rumi, and I hope you poached the eggs in the Cab! Happy New Year, Links, and my eggs were fried that morning in the galley of my motel. One of the things good about Value Place is that the rooms have a small galley, which is all I really need.